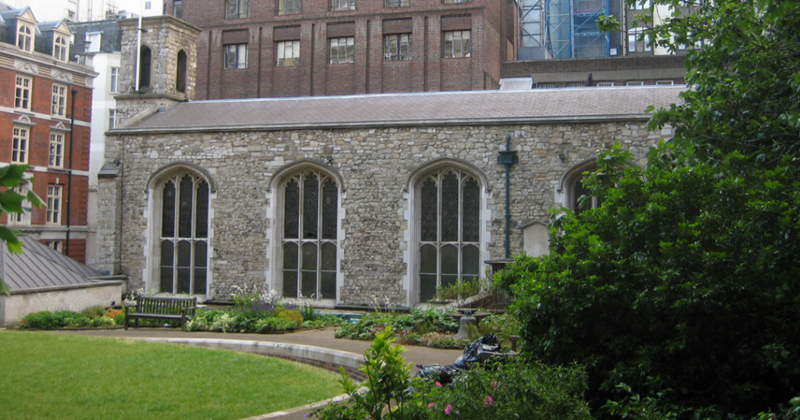 The Savoy or Queen’s Chapel was part of the Savoy Palace, built by Henry, 1st Duke of Lancaster, in the 14th century. Prior to that, the land had been granted to Peter, Count of Savoy, from where it gets its name. in 1361 the palace was inherited by John of Gaunt, but was destroyed during the Peasant’s Revolt of 1381. In 1505 Henry III ordered that the palace should be rebuilt as a hospital for the poor and it was probably at this time that the Savoy Chapel was built. The buildings continued to be used as a hospital into the 17th century for wounded soldiers, but in the early 1700s it had fallen into disrepair and partly burned down in 1776. It remained in a ruinous state until 1816-20 when much of the site was cleared to make way for Waterloo Bridge with the exception of the chapel. Fire damaged the building in the 1860s, leaving only the exterior walls remaining, but it was rebuilt. In 1890 it was the first chapel to be lit by electricity and was a fashionable place to be married – another part of the Rags and Riches story.